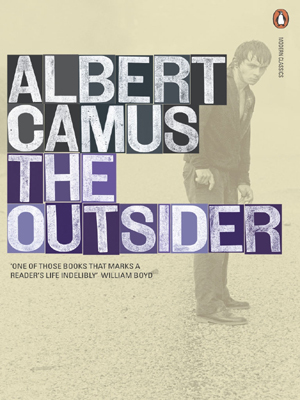 Widely considered to be an Absurdist rather than an Existentialist novel, Albert Camus' brilliant The Outsider (or The Stranger) is, in essence, an attempt to describe his belief in man's alienation from his fellow man except as part of an uncaring, amoral, godless universe. 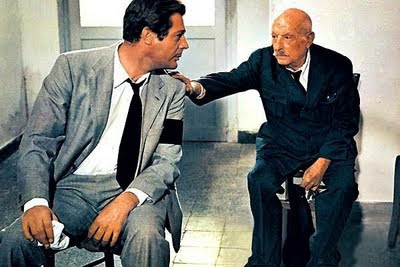 Meursault, a pied-noir (like Camus, a French inhabitant of Algeria), fails to cry at his mother's funeral. He is alienated from the proceedings, able only to experience relative truths by his physical senses. "Mother died today. Or maybe yesterday, I don't know. I had a telegram from the home: 'Mother passed away. Funeral tomorrow. Yours sincerely.' That doesn't mean anything. It may have happened yesterday." He befriends Raymond and helps him to dispose of a mistress, whose brother confronts the pair, and Raymond is injured in a knife fight. Meursault returns to the beach and shoots the brother dead, in an act not of revenge, but induced by the sun's glare. He is tried for murder where his dedication to truth leads to his conviction. He is convicted for his inability to express emotion, especially remorse. As an atheist he is outraged by the chaplain's attempt to convert him and thus subvert the earthly justice in which he believes so passionately. "The presiding judge told me in a bizarre language that I was to have my head cut off in a public square in the name of the French people. Then it seemed to me that I suddenly knew what was on everybody's fact. It was a look of consideration, I'm sure. The policemen were very gentle with me. The lawyer put his hand on my wrist. I wasn't thinking about anything anymore. But the presiding judge asked me if I had anything to say. I thought about it. I said, 'No." 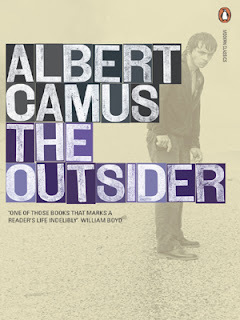 Born in Mondovi, Algeria in 1913 to working class parents, Albert Camus lived a youth of Muslim faith and solidarity. His father, a staunch French patriot, left home in 1914 when Camus was a baby to fight for France in the First World War. He was killed in battle, leaving his illiterate wife to raise Albert and his older brother alone. With the help of her mother, Madame Camus influenced her son's future career, as he later wrote frequently about mother-son relationships (and very infrequently about father-son relations). At the age of 17, Albert came down with a severe case of tuberculosis and was forced to leave home and begin his life exploring independence and a solitary existence. He studied hard and graduated from the university with a degree in philosophy with the goal of becoming a teacher. Camus took up work as a journalist, spent time in the theater, and wrote several controversial essays about Muslims in Europe. He had a short-lived (two year) marriage to Simone Hie and joined the French Resistance against the Nazis during World War 2. With such personal and individual development, Camus found a niche in the world of existential thinking. According to Encarta Encyclopedia, existentialism is an overt emphasis on individual existence, and consequently a focus and challenge on subjectivity, individual freedom, and choice. Perhaps because Camus ventured into the world at a young age and found himself involved with the politics of World War 2, did he write so eloquently in this realm of literature and philosophy. 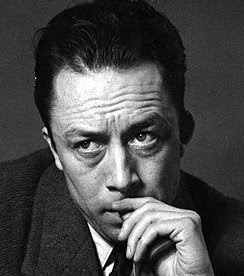 Camus died suddenly in a car accident in Paris in 1960, truncating a successful and influential career as a teacher, writer, journalist, playwright, and thinker. His library of work includes his first and most famous, The Outsider/ The Stranger, The Myth of Sisyphus, The Plague, The Fall, The Rebel, A Happy Death, Exile and the Kingdom, Caligula and Three Other, The Possessed, Resistence, Rebellion, and Death, Notebooks 1935-1942, Notebooks 1942-1951, Lyrical and Critical Essays, and Cashiers I. His political essays and contribution to literature and philosophy have placed him amongst such company as Plato, Nietzche, and Kierkegaard, and several of his quotations have even become staples in political speeches and personal salutations. It is such language as this quotation that places Camus in the foreground of academia and philosophy. Camus' works have been translated from their original French into countless languages and are studied in philosophy classes across universities around the world. He was awarded the Nobel Prize for literature in 1957.